Just wrote a poem that is imbued with my feelings at the screening of the video Les Goddesses by artist Moyra Davey at the Empire State. Art in NY exhibit at the Palazzo delle Esposizioni here in Rome. A poem inspired by Mary Wollstonecraft, laudanum, illness of the soul, the Shelleys and freeze-frames. So much going on. Something truly inspiring. June has been a month full of pleasant surprises. More than I could have predicted. A month in which I have started writing and submitting poetry again with new enthusiasm. 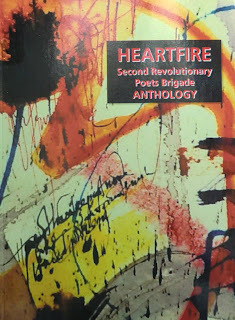 And then, HEARTFIRE, Second Revolutionary Poets Brigade Anthology edited by Jack Hirschman and Agneta Falk has reached Rome in a box full of contributor's copies. It is a joy to have one's poems in there and it is a greater joy to have had the chance to translate into English so many wonderful Italian poets. The book is a thing of Beauty. If anyone happens to be in San Francisco next July 7th, please don't miss the chance to celebrate the launch party of the book at The Emerald Tablet. Many wonderful poets will be there. Go, listen to them recite revolutionary poetry and get youreslf a copy of the book. It will be a very lively event. No doubt!